The ancient city of Rome and its many architectural masterpieces need no introduction, but this painting may. 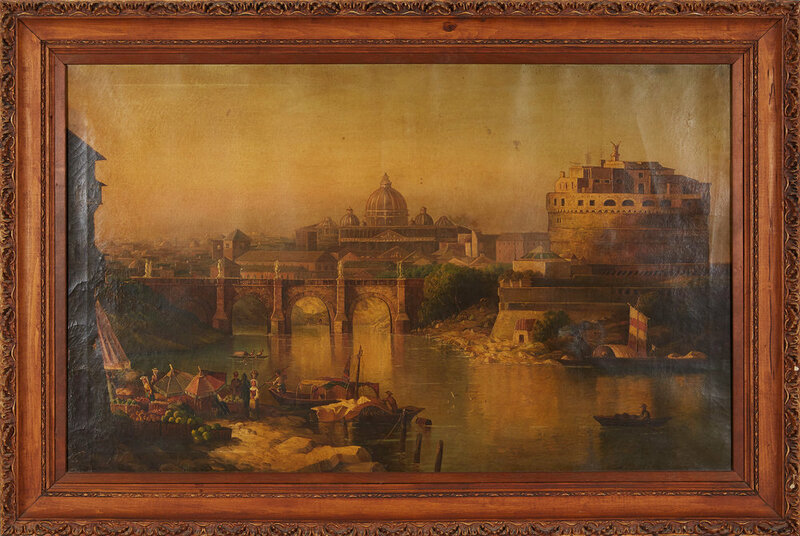 Depicting a charming scene of the Tiber River as it flows through Rome, this late 18th century Italian painting was brought to The Center for treatment by a client whose family hoped we could revive the color in their yellowed painting. The painting had been passed down through generations and held great sentimental value to our client. The piece was initially acquired by the family between the mid-1940s and 1950s, and was displayed in the family home for many years. Our client always wanted to have the painting cleaned and decided to bring it to a “mini antiques roadshow” in Maryland, where he was encouraged to have the piece conserved. In hopes of preserving the piece for future generations of the family, our client brought the painting to The Center. The painting suffered largely from age-related issues and previous failing restoration efforts. The canvas was brittle, with moderate deformations and prominent stretcher creases throughout and three old canvas patches adhered to the verso with glue. The paint layer exhibited extensive raised and flaking mechanical cracks on the lower left side with areas of associated paint loss throughout. In addition, the painting exhibited discolored repaint and varnish. Our painting conservator began by consolidating areas of flaking paint, surface cleaning the painting, and removing the layer of discolored varnish. The canvas was taken off its stretcher and the old patches removed with a scalpel. The reverse of the canvas was vacuumed and then flattened on a suction table to remove deformations. Next, the painting was lined to an additional canvas and stretched onto a new stretcher. A coat of varnish was applied, followed by a series of inpainting and varnish layers. Lastly, the painting was coated in a final layer of varnish. With the conservation complete, the painting was installed into its original frame, which received a cleaning and touch up by our Framing Department. Our art handling team delivered the piece to the family home, where it now proudly hangs in the dining room. The conservation process allowed our clients to learn more about their treasured family heirloom and revealed the painting's original beauty.